Irish competitors in this year’s BMW European Championship at Howth in September had an 8-race warm-up on Lough Erne over two days (August 13/14) at the Irish J/24 National Championship, sponsored by Waterways Ireland. The defending champion Flor O’Driscoll and his crew on ‘Hard on Port’, retained their Irish title but they were pushed hard all the way by the two McCaldins, Mickey (‘Murder Picture’) and son JP (‘Jamais Encore’), from the host club. The eight-race championship was sailed in a wide variety of wind strengths, with rain showers a feature on both days and particularly heavy conditions for the final race. O’Driscoll and crew started slowly by their standards with a 3rd and 4th while the McCaldins took it in turns to cross the line first. He got more into his stride in race three and five with bullets but had an OCS in race 4, ultimately his discard. 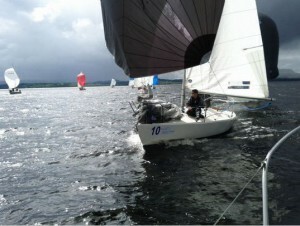 Andrew Mannion of Lough Ree YC sailing ‘Jeb Stuart’ won the fourth race comfortably while a former champion Stefan Hyde on ‘Kilcullen’ took the last race of the day. With the McCaldins the only major threat on the second day, O’Driscoll sailed two tactically clever races to ensure that neither could overtake his lead, finishing second to Mickey in race 7 and one place (4th) ahead of JP in the final race (won by Stefan Hyde again). After discards, he had a 7-point margin of victory, a reward for consistently finishing in the top three in six of eight races. The Irish fleet have another opportunity to rehearse before the BMW Europeans, this time on the same race track, with the J/24 Easterns due to be run by HYC’s neighbours Malahide Yacht Club on September 3rd/4th.